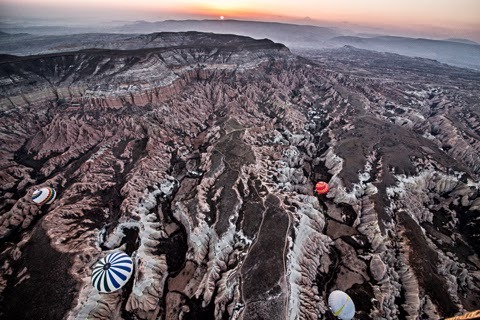 Sunrise from balloon over Cappadocia, Turkey. Photos by Joel Simpson. IN case you were wondering what happened to Moses' famous staff, the one that turned into a serpent that ate the serpents of the staffs of Pharaoh's magicians (13th Century BCE), it's in Istanbul. I saw it. It's one of the relics enshrined in Istanbul's Topkapi Palace Museum, the former Sultans' palace and compound, Turkey's version of the Louvre or the Forbidden City. 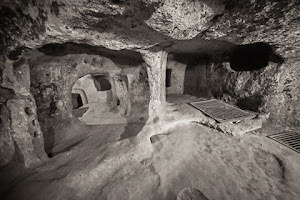 That same room also houses a sword of King David's and Joseph's turban, exceptionally well-preserved for fabric – and who knew he sported a turban? There's also a footprint of Mohammed in what looks like glazed mud. Topkapi consists of a sprawling walled compound, pleasantly landscaped with masses of tulips grouped by color, and fragrant hyacinths. From the bejeweled items one sees there in profusion, it's clear that the Sultans denied themselves nothing. One speculates that the "sick man of Europe" – the Ottoman Empire – choked on its gemstones. Unfortunately, no photography was permitted inside. Turkey was the first stop on a 10-week, around-the-world tour. Of all of the 12 countries that my travel companion, Barbara, and I visited, Turkey was the easiest to travel in. It was also one of the most rewarding, visually and gastronomically. 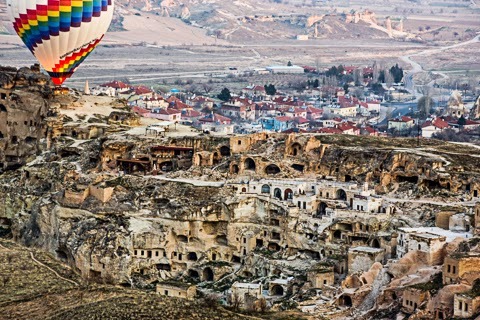 Neighboring ballon over Urgüp, a town carved out of the soft volcanic tuff rock. The target area was Cappadocia, known for its curious geology and early Christian frescoes in tiny hollowed-out churches. We took the overnight bus from Istanbul, arriving in Kayseri the morning after. We rented a car and drove 40 kilometers to the tourist hub Urgüp, then its quieter suburb, Mustafapasha. We stayed in the Old Greek House,a venerable mansion reeking with history and color. (http://www.oldgreekhouse.com/en/). 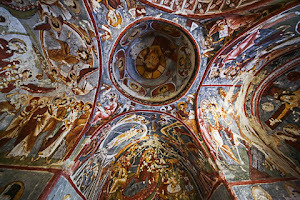 One of the best preserved frescoes in the tiny churches of the Goreme Open Air Museum. The balloon ride afforded views of the famous pinnacles, the “fairy chimneys,” the tent rocks, here and there striated with bands of iron oxide (orange) and manganese (black) marching through their forms. 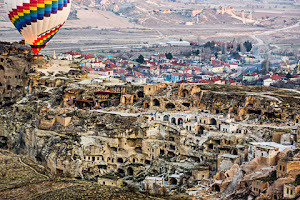 Visible, too, is what seemed like an entire village carved into the soft volcanic tuff rock. Awaiting us back at the hotel after the balloon ride was a breakfast feast of a sumptuous breakfast with halvah, feta, dried fruit and preserves and a very tasty apricot and blackberry jams. Later at the the Gorême Open Air Museum, we saw carved-out chambers that had been used as tiny churches, no bigger than a kitchen, but often decorated with the most extravagant frescoes. Dating back 700, 1000, 1200 years, some of them are horribly defaced but others are in fairly good condition, their colors brilliant.(http://www.goreme.com/goreme-open-air-museum.php). Elsewhere, a hike down Ilhara Valley allowed an exploration of random holes in the cliff-face, which turned out to reveal elaborate frescoes of rows of churchmen, horribly defaced. The following day we marveled at two “underground cities” of Derinkuyu (http://www.goreme.com/derinkuyu-underground-city.php) and Kaymakli (http://www.goreme.com/kaymakli-underground-city.php), which went down five levels and eight levels, respectively. They could provide enough air, water and food to hide 5,000 people from invaders for six months. View of underground city of Kaymakli. The earliest of these cities were dug out 4000 years ago. When the Christians arrived, they extended them farther down. 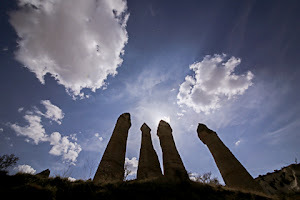 Our itinerary included visits to places with names like Selime, “a troglodyte village” carved into conical rocks, and Keslik Monastery, similarly carved. The monastery is home to 18th century graffiti alongside the 9th century frescoes. En route to the monastery one can pass Love Valley. Its cap-rocked pinnacles are so phallic that the name was unavoidable. Back in Mustafapasha a delightful discovery is the Doll and History Museum. It is also a guest house. Small local museums inevitably offer surprises such as artifacts of lives of centuries past, local artworks and whimsical constructions. This one shows off the sweep of Turkish history and culture – through dolls! 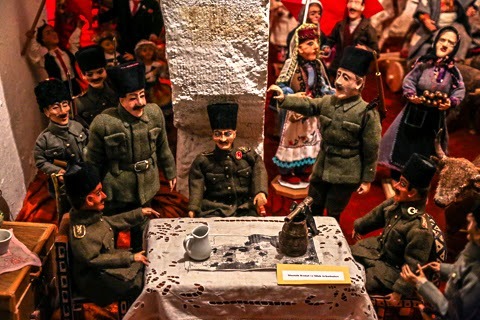 Mustapha Kemal declaring Turkish “independence” from the Ottoman Empire, represented in dolls at the Doll and History Museum, Mustafapasha. Incredibly, all of the dolls were made by one woman over the past 30 years, including the great sultans and sultanas, Turkish street merchants, philosophers, poets, janissary musicians, dervishes and Mustapha Kemal himself on the day “independence” was proclaimed. She had even captured the likeness. Her son curated the museum while she stayed out of sight in the kitchen, surrounded by the products of her prodigious canning. I managed to meet her nonetheless. Visit http://www.wahcenter.net/2015/01/around-the-world-in-10-weeks-in-two-hours/ to learn more about "Around the World in 10 Weeks––In two Hours."